These heavy-duty earth anchors are used for securing poles, tower, trees, stages and other similar structures. We sell them into the arborist, tower rigging and stage rigging industries. 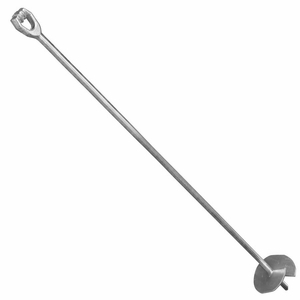 They are known as helical anchors, earth anchors, earth augers and helix anchors. They are popular because they are both strong and economical, and install easily. Simply turn/screw the anchor into the ground using a strong bar placed through the anchor's forged eye. No special tools required--may be installed by hand, or with machine power. Designed with a forged triple eye rod with an angled point and a firmly welded helix. A hot-dip galvanized finish meets ASTM Specification A153, Class C for long resistance to rust. Available below in three sizes, from 3/4" - 1-1/4". Additional sizes available upon request. Strength ratings are valid only for properly installed anchors.